Master batsman Sachin Tendulkar came up with a career best knock smashing a supreme 175 from 141 balls but his team still came second in a mammoth run chase of 351. Australia won a cliffhanger of a match by just the three runs after keeping their nerve intact unlike the Indians. As much as Australia and Tendulkar were the winners, due credit has got to be given to the pitch at the Rajiv Gandhi International Stadium and its curator as the cricket fans got to witness about 700 runs in an ODI powered with 55 boundaries and 22 sixes! Not just that, the full house at the magnificent stadium in Hyderabad were even honoured to witness the historical moment of Sachin Ramesh Tendulkar becoming the first ever player to cross 17,000 runs in One Day Internationals. The Aussies who made three changes in this match won the toss in the afternoon and had no hesitation to bat first on a sporting track. The bowlers had to be clever enough to use the bounce to their advantage as well. A couple of overs into the match and one could easily tell that the Aussies were going to put atleast 350 on the board. Shane Watson took the initiative by pulling in the air and his partner Shaun Marsh worked his way in scoring some runs as well. The openers almost put on 150 on the board before the aggressor Shane Watson missed out a century narrowly after top edging a slog sweep off Harbhajan around the half way stage. Watson’s 93 came in 89 balls with 9 forus and 3 sixes. Skipper Ricky Ponting further consolidated the innings further with the steady Shaun Marsh taking the team close to the 250-mark inside the 40 overs. Ponting made a run-a-ball 45 before his pull shot was defeated by a slower leg cutter from Praveen Kumar during the batting powerplay. At the other end, left hander Shaun Marsh with his maiden century created a unique record. The record was that of Geoff Marsh and his son Shaun Marsh becoming the first ever father-son duo to score ODI hundreds. Marsh finished his knock with a run-a-ball 112 with 8 fours and two sixes. India had more trouble awaiting at the end of the innings with both Cameron White (57 from 33 with 5 sixes) and Michael Hussey (31* from 22) whacking 80 runs in about 7 overs. Amongst the Indian bowlers, Harbhajan Singh (1/44 in 10 overs) and Yuvraj Singh did well in damage control. Munaf Patel, who came in for Ishant Sharma in the match proved no good. The Indian chase began well with Sehwag wasting little time and Tendulkar as always playing himself in for the long haul. The Aussies did very well to keep a dangerous opening stand down to 66 inside 9 overs. Sehwag after running away with 38 from 30 balls was bounced out by Hilfenhaus. Gambhir came in and went out without causing much worries to the bowling side and few overs later the biggest match winner of Indian in ODIs and T20Is – Yuvraj Singh spooned a return catch to Watson off a rising delivery to leave India at 126 for 3 in the 19th over. Sachin Tendulkar at one end was playing the ideal knock but like always wasn’t getting solid support at the other end. Skipper MS Dhoni tried to do that before his full blooded cut shot got caught stunningly at point by Voges. It was curtains for the batting side at 162 for 4 in the 24th over but fortunately for the Indian fans, new man Suresh Raina and Tendulkar had other ideas. Raina was determined to produce a special innings himself while Tendulkar was batting with a lot of freedom having already danced down the track to play some vintage lofted shots as well. Raina wasn’t going to be the one to just stand and admire Sachin’s batting but he did the other way around as well with his own breathtaking shots out of the ground. Tendulkar was relaxed after easing past his 45th ODI hundred in just 81 balls during the initial stages of the partnership. India had got the monstrous target of 351 down to just a little over 50 at run-a-ball. The match looked secure but Suresh Raina (59 from 59 balls with 3 fours and 3 sixes) provided a breather for the Aussies with a predetermined pull shot that landed his team in trouble again at 299 for 5. It was again a superb catch from the Aussies. Raina’s wicket came with a bonus of Harbhajan’s for the Aussies to add the extra pressue on Sachin with the score reading 300 for 6. The batting powerplay at this stage came handy for the Indians and they had the extra batsman in Ravindra Jadeja who did very well to pull off two crucial fours and reduce the target to just 19 from 18 balls. With the match in the pocket, Sachin Tendulkar came up with a huge blunder after going for a high risk paddle off debutant medium pacer Clint McKay to get caught at short fine leg. It was just a matter of knocking the 1s and 2s with the straight bat but Tendulkar for that moment forgot the basic thing and tried to be too cute but only to perish leaving more than a sniff to the Aussies. The Master left the field with a monumental 175 helped with 19 fours and 4 sixes. It was déjà vu for India as the remaining players choked starting with Jadeja running himself out in a disgusting manner and followed up by a needless lofted shot by no.10 Ashish Nehra. Praveen Kumar, who had all the ability to still finish the match blasted a six in anger but left with just Munaf had the difficult task of getting 8 from the final over. In the fourth ball of the final over, he was desperate to retain the strike with a second but didn’t dive into the crease from saving his wicket and India from a heartbreaking defeat. Again it was a result of a brilliant fielding effort from the Aussies with an unexpected throw coming all the way from long off to the batting end. 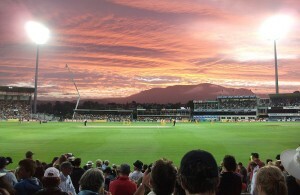 The Aussie bowling was led by Shane Watson (3 for 47) and debutant Clint McKay (3 for 59). India fell short by 3 runs and it left with two perspectives yet again – one of them is that of the Critics of the ‘Best Batsman Ever’ that Sachin Tendulkar is not good when it comes to finishing matches and that he chokes when it really matters. Sachin’s devoted fans on the other hand get another opportunity to hail him as the God of Cricket and scream that he can’t get all the runs himself and in turn ask what the other 10 players are doing in the team. Whatever is true, it was the Aussies going 3-2 up in the 7-ODI Series and are now one win away from clinching the series.